When does making music not involve playing actual music? When you’re a “Radical Christian,” apparently. A gent named Wes McAdams has a couple blogs that popped up on my Facebook feed. His site is titled “Radically Christian – 1st Century Christianity in a 21st Century World.” One post calls into question why some churches feel musical instruments are a necessary part of the worship service. The next challenges the idea that instruments have any place in today’s church at all. It concerns me when people assume they’ve found the secret, the missing spiritual link, the one thing that every “good” or “true” Christian should be doing (or not doing) in order to show how much more Christ-like they are than everyone else. Usually that’s the road to heresy. Because if Jesus isn’t the One Thing–if your message becomes “Jesus and (fill in the blank)” instead–then your Gospel isn’t the good news of grace anymore. It becomes all about doing something to prove your faith and earn your reward. Or it becomes yet another self-righteous way to show how much better you are than the benighted and corrupted so-called Christians in every other church. However, since I have been a lead worshiper at times in the past, and since one of my passions is worship (to include specifically the musical part often done in church gatherings), I wanted to give Mr. McAdams’ points due consideration. At best, he’s being silly and nit-picking, but generally harmless. At worst, he’s way off Scripture, and his condemnations foist an assumed truth based on misunderstandings upon his readers. He makes important points about what worship has become to many churches. It can be a spectacle or performance with little or no heart. It can be focused on the congregation without giving due regard to the God we’re supposedly worshiping. It can be a misguided attempt to draw more people who otherwise might not be interested in church. And it can feel like a talent show where people get attention. Those faults are also potentially true of everything else we do in church. But we don’t stop preaching even though I’ve heard people talk about what a powerful speaker a pastor is. We don’t stop giving to the community for fear that someone might do it to be seen doing good. We don’t stop sharing the Gospel even though some Christians talk about the converts they’ve made like an ace pilot keeps track of his kills in combat. McAdams’ post questioning whether we need instruments in worship makes so many important points that I wish I could share it for all that’s right in his assessment of modern worship. He mentions so many causes for concern that I personally share. Modern worship runs the risk of becoming a distraction, a business model, a Play-Doh fun machine churning out tepid and indistinguishable songs onto albums to create dollars instead of devotion. But the critique goes awry when McAdams takes a logical point (you don’t need instruments to worship) and makes it a mandatory stance (churches must not use instruments to worship). He does this even while pointing to scripture that tells us to do whatever we do for the glory of God. In so doing, he throws the grace out with the guitars. The second post I linked is McAdams’ case for why instruments ought to be forbidden in church. He uses the example of ordering a pizza. If he orders a pizza with Canadian bacon and pineapple, those are the toppings he expects to receive, no more, no less. The analogy is, if God in the New Testament only mentions making music with our lips and our thankful hearts, then those are the only “toppings” God wants on His praise-pie. The New Testament makes no mention of musical instruments, only psalms, hymns, and spiritual songs. And McAdams argues, that silence is a prohibitive restriction in the same way that I don’t need to say “No green peppers” if I order his pizza as described earlier. What would 1st century hearers possibly think when told to sing psalms and hymns? Would they possibly think of the psalms of David and others recorded in scripture? Would they see it in a way appropriate to their culture? Was music with instruments forbidden as an expression of worship for the Jewish people? That search took all of two seconds. And there’s plenty more. McAdams makes the case that the Old Testament doesn’t apply here, just like the pizza order I made last week may not be the toppings I want today. We’re under the New Testament, so what God orders in the New is all that matters. But the OT informs the NT, and gives us a perspective on the understanding 1st century hearers would have. Otherwise, let’s strip it out of the Bibles, because we only need what is recorded in the NT, right? By definition, “psalms” and “songs” could be logically assumed to involve music with instruments. The counterpoint to his pizza analogy is that—without specifically saying so—he expects his pizza toppings to arrive placed upon a crust covered with sauce and cheese, because that’s what a pizza is. I guess you don’t want these, because you didn’t specifically ask. The difference between his misguided focus and my rant is this: grace. A radical thought, I know… but one that’s big enough for us all to come together. Good post, David, and very relevant to me. I was raised in the Church of Christ, and the mantra was always not to add to or take away from scripture. Not using musical instruments was a badge of honor, but smacked of Phariseeism. I will say that congregational a cappella music is amazing and glorious to hear and participate in, but you are completely on target. Grace is the difference. 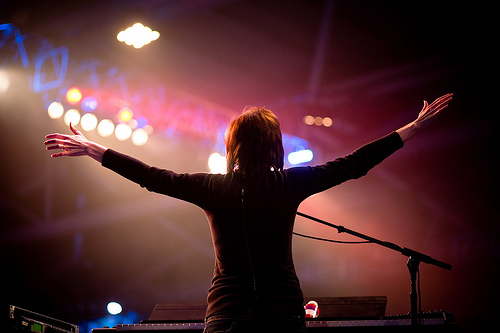 I’ve come a long way in my understanding–I’ve been a worship leader in a Baptist church (with piano! ), and now sing in a choir. It’s all about glory to God. Radical!